Napoleon's Old Guard Surrender to the British at Waterloo. The ending point of the Second Hundred Years War. The Second Hundred Years War-Wars between England (also referred to as Great Britain or the United Kingdom), and France that ran from 1688 to 1815. From 1688, with the start of War of the Grand Alliance in Europe with Britain and France fighting on opposite sides, a Second Hundred Years War took place between these two long-time foes. The events of the year 1688 began a period of hostility between the two nations that would continue, with some interruptions, until 1815. The decades prior to 1688 had been years of an alliance between England and France, largely because the English kings Charles II and James II (Pro-Catholic and Catholic, respectively), had allied themselves to the Catholic French kings. The overthrow of James II by the Protestant King William III and Queen Mary, triggered this long round of fighting. William and Mary allied England with the many foes of France, and thus began a long period of Anglo-French Wars, later dubbed "The Second Hundred Years War." NOTE: The first, and original Hundred Years War was also fought between England and France from 1337-1453. This conflict was actually a series of Anglo-French wars fought over the course of 116 years. War of the Grand Alliance/King William's War (1688-1697)-Known in Europe as the War of the League of Augsburg and in North America as King William's War. War of the Spanish Succession/Queen Anne's War (1702-1712)-Known in Europe as the War of the Spanish Succession, in North America as Queen Anne's War and in India as the First Carnatic War. This conflict also included the Second Abnaki War. The Abnaki Indian tribe allied itself with the French against the English colonists in North America. War of the Austrian Succession /King George's War (1744-1748)-Known in Europe as the War of the Austrian Succession and in North America as King George's War. The war between Spain and Britain (known as the War of Jenkins' Ear), had begun in1739, and was later folded into the larger War of the Austrian Succession, with France joining the Spanish in war with Britain and her allies. Seven Years' War (1756-1763)-Known in Europe as the Seven Years' War and in North America as the French and Indian War (which began in 1754). France forever lost possession of Quebec/Canada. In many ways, England's victory set the stage for the American Revolution. The American Revolutionary War (1775-1783)-While this war began in America in 1775, France did not actively join Also involved Spain, the United States and the Netherlands against Britain. The result of this war was the loss of the 13 British American colonies, though the British were able to successfully hold onto Canada. The aid that France contributed to the American victory, also laid the seeds for the later French Revolution, as the financial costs drove the French royal government to impose more taxes on the people of France. Also, the ideas of liberty and democracy from America had a strong influence on later French Revolutionary leaders. Wars of the French Revolution-(1792-1802)-The Wars of the French Revolution spanned a decade of great political, social and military change throughout the European continent. British Historians divide these wars into two distinct parts: The French Revolutionary War (1792-1802), and the Napoleonic War (1803-1815). The French consider this period as one long war, referring it to the War of the Republic and Empire. War of the First Coalition-(1792-1798)-Britain, Austria, Prussia, Spain, Russia, Sardinia and Holland combined to fight Revolutionary France. Russia left the Coalition in 1794 to deal with troubles in Poland. French victories forced Holland, also known then as the Batavian Republic, to leave the Coalition in 1795. Prussia and Spain made peace with France in 1795 and Austria signed the Treaty of Campo-Formio in 1798, surrendering the Austrian Netherlands (now Belgium) to France. This war included the battles of Neerwinden, Mainz, Kaiserlautern (early Allied victories). Later, as the Revolutionary government organized the populace and fielded huge "citizen armies" commanded by brilliant young generals like Napoleon Bonaparte, the French won many battlefield victories. War of the Second Coalition-(1798-1801)-Britain, Austria, Russia, Portugal, Naples and the Ottoman Empire combined to fight Revolutionary France. Spain later joined France against Portugal. Can also be considered as a Franco-Austrian War , a Franco-Russian War, a Anglo-French War, a Franco-Turkish War, a Franco-Neapolitian War , a Franco-Portuguese War and a Franco-Russian War. This alliance against France formed to counter French moves in Italy; formation of the Roman, Ligurian, Cisalpine and Helvetic Republics in Switzerland and Italy, and the deposition of Papal rule in Rome. Naples was conquered by the French in early 1799 and declared to be the new Parthenopean Republic. 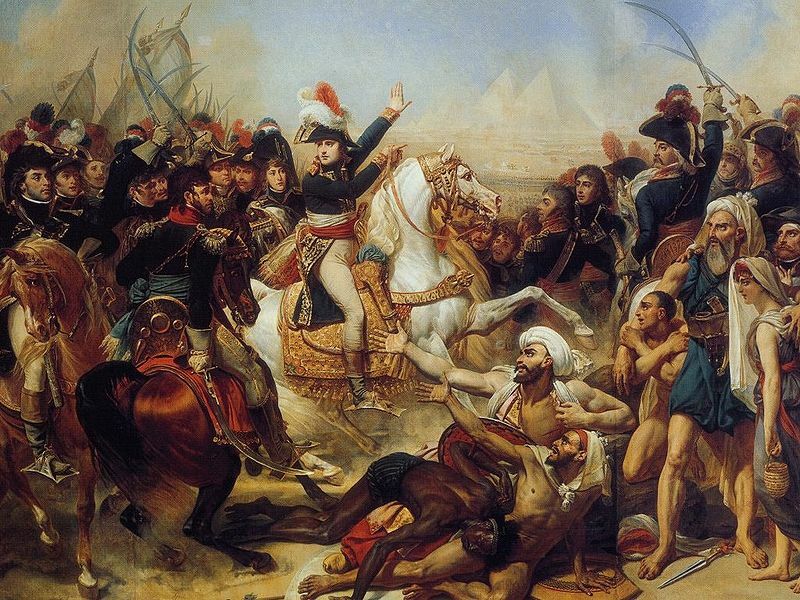 French General Napoleon Bonaparte invaded Turkish Egypt and won the Battle of the Pyramids, continuing his march into what is now Israel and Lebanon. British Admiral Horatio Nelson wiped out the French fleet at the Battle of the Nile in 1798. 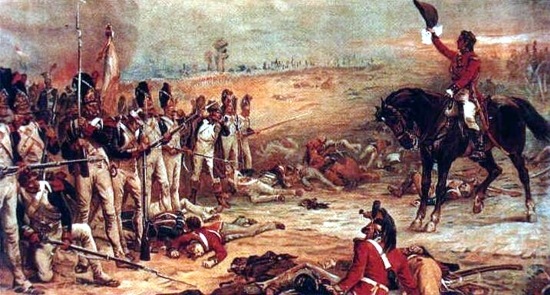 Due to French victories on land against both Turkish and British troops, the Ottoman Empire made peace with France at the Convention of El-Arish in 1800. Part of this Coalition war is the so-called War of the Oranges (1801), in which France and Spain invaded Portugal. France sought to end Portugal's trade with Britain, and Spain sought Portuguese territory. In the Peace of Badajoz, Portugal promised to end trade with Britain, give land to Spain, and part of Brazil to France. This "Brazilian" land is the modern-day French Guiana. This war included the battles of Cassano, Tribbia River and Novi (early Allied victories). Following Russian withdrawal from the war due to quarrels with Austria, the French under First Consul Bonaparte won the Battle of Marengo in 1800. The Coalition collapsed after Austria lost the Battle of Hohenlinden in December, 1800 and signed the Peace of Luneville in February, 1801. Britain's Napoleonic War (1803-1814)--While other European nations waged war and then sued for peace against Napoleonic France, Britain was in a continual state of war against France from 1803 through the first defeat of Napoleon in 1814. Other nations joined Britain in various Coalitions, (the Third through the Sixth Coalitions) in this period, but all of these Coalitions failed to defeat Napoleon until the Sixth Coalition, which began when Napoleon foolishly invaded Russia in 1812, and ended with his surrender and exile in 1814. Peninsular War (1807-1814)-This war began with the French Invasions of Portugal and Spain, and also included Great Britain, who sent forces to help the Portuguese and Spanish drive out the French. From the British perspective, the Peninsular War was a part of the long-running war between Britain and France from 1803 to 1814. The period between Napoleon's surrender in 1814, and his return to power in 1815, while peaceful in that there was no military combat, was still technically a period of war, as the final peace treaty with France (now ruled by the old French Bourbon kings) was still being negotiated at the Congress of Vienna when word reached the assembled Allied leaders that Napoleon had escaped from Elba and was raising a new army. War of the Seventh Coalition (1815)--After Napoleon's defeat in 1814, Napoleon was sent into exile on the island of Elba by the victorious allies. Napoleon, however, had no intention of spending his life in exile. Gathering his followers, Napoleon escaped Elba, landed in France, and began what is referred to as "The Hundred Days," in which he reclaimed the leadership of France, and once again faced off against a coalition of foes. His defeat at Waterloo by British and Prussian forces put an end to this last of the Napoleonic Wars. Thus ended the "long century" of wars between Britain and France. The term, "The Second Hundred Years War" was coined by British historian John Robert Seeley, in a book he published in 1883. He saw the eight (by his count) wars between Britain and France from 1697 to 1815 as thematically linked by politics and war to form a connected series of wars for empire and, in essence, national survival of the British Empire.